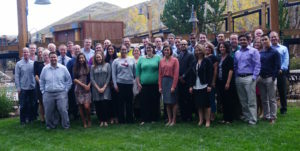 HCRN investigators and coordinators gathered in Deer Valley Utah this past week to advance the research of the network. Investigators from all 14 sites, including the five recently added sites, were all in attendance making it our largest meeting yet. Study PIs reviewed the status of their research including preliminary analysis from Jay Riva-Cambrin’s “Ventricular Involvement in Neuropsychological Outcomes in Hydrocephalus” and pilot studies in endoscopic third ventriculostomy with choroid plexus cauterization and patient / parent attitudes toward risk in hydrocephalus surgery. The latter study was conducted in cooperation with the Hydrocephalus Association to garner feedback from more than 200 patients and caregivers about acceptable levels of risk for different surgical interventions. A fair amount of time was spent determining how to most efficiently leverage our burgeoning registry data. The HCRN registry has more than 12,000 surgical events chronicled from more than 5700 patients. Passionate discussions ensued about how to use the registry data to make new findings in hydrocephalus and to drive new quality improvement initiatives.